One Person’s Trash is Another’s…Livelihood? Our class recently toured Pondicherry’s Kurumbapet dump yard with EcoPro, a local NGO, to become familiar with the city’s trash problems. As we walked over bubbling puddles of methane gas caused by the decomposing trash, most of us covered our mouths to prevent the smell from entering our noses and mouths. Some of us even went as far as wearing sunglasses, despite the sun setting behind the horizon. 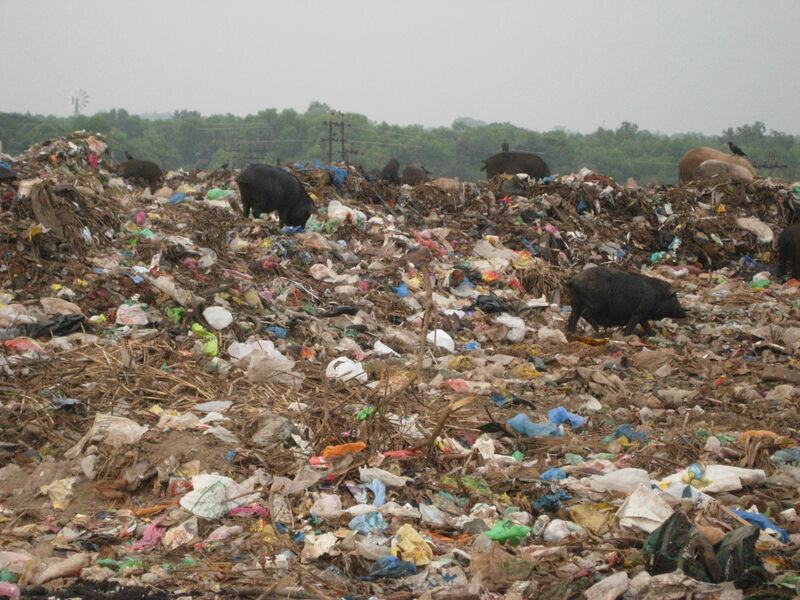 Although having lived in two world cities where there are bad smells on a good day and vile smells every other, the odor from this mid-sized south Indian city’s trash site was a little nauseating, even to me. At one point during our tour, three little children appeared over one of the waste mounds, curiously observing the oddity that was us in a place like this. As our conversation with the NGO continued, the children gradually came closer to us, as though they were timid animals feeling out the strangers before them. Before I knew it, they were within an arm’s length of us; we could have hugged them had we wanted. Had it not been for the tattered clothing and sludge-covered feet, one would have assumed from their cheerful and easygoing dispositions that they were just ordinary children mischievously playing amongst the city’s trash — but they weren’t. 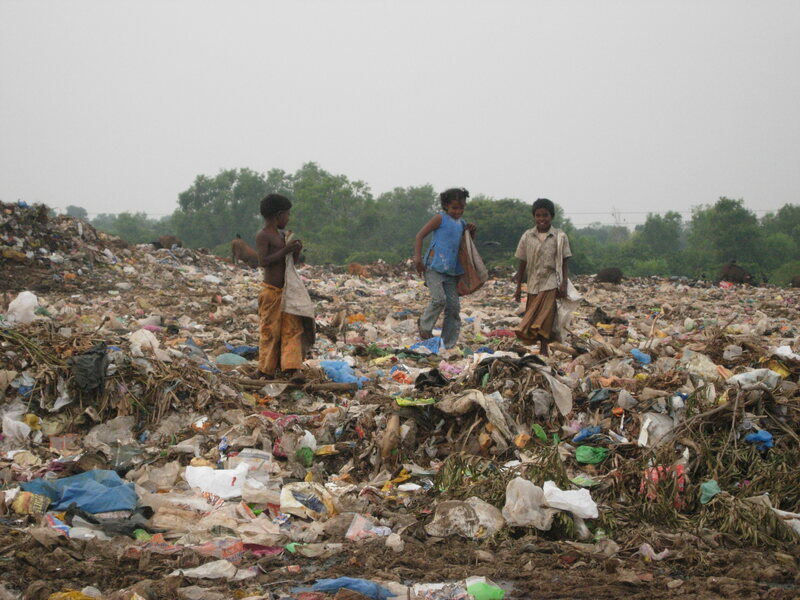 They were gypsy trash collectors; a social status in India lower than the Dalit (untouchables). 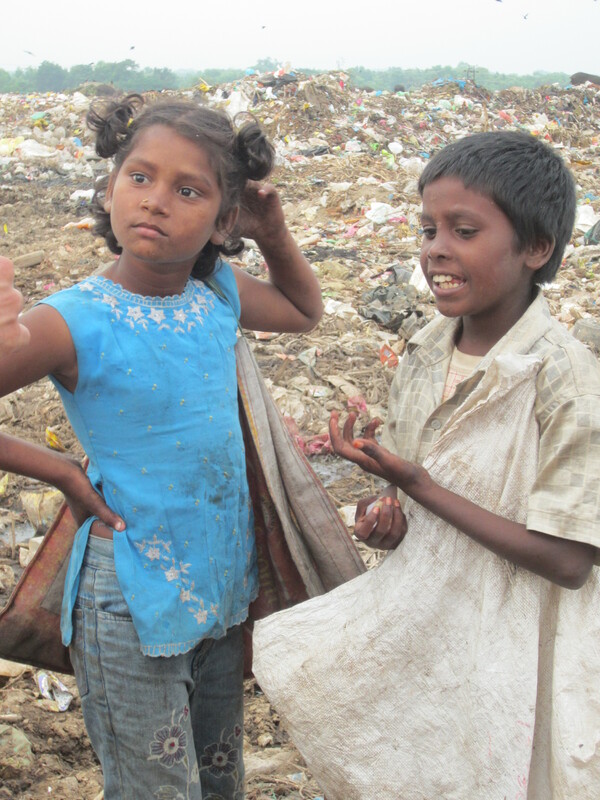 For these three young children, their job is to roam the dunes of waste hoping to find anything of value that they can collect and exchange for Rupees to support their family and community. Holding their trash-collecting bags, they smiled at us and giggled secretly amongst each other as we gave them candies and empty plastic bottles, one of the prized articles found in the landfill. I was astonished at how they were unfazed by the very smell that kept reminding me of where I was with every breath I took. I guess it’s safe to assume they were used to it. At that moment I remembered something a friend once told me: If you are born an American, consider yourself the luckiest person on planet Earth. A title like that weighs a lot when you’re the select few chosen in a genetic lottery. Suddenly, I got that knot in the throat one gets when you feel you’re about to cry. I didn’t even understand why. It could be because of what I was witnessing at that moment, and maybe a feeling for something I didn’t even understand­ — and never will. Later that day, some colleagues and I discussed revisiting the Pondicherry landfill to give the children some shoes, maybe even a hot meal for their little tummies. For me, this dialogue engendered a promise I’d like to accomplish while here. There are few personal promises I make to myself that when fulfilled, I feel thoroughly satisfied. Most promises we make in life relieve only temporary feelings of superficial requirements we think are necessary. Our time here in Auroville is brief; let’s hope we can create a benevolent memory for ourselves by doing our best to help as many people as we can. Few will have the greatness to bend history itself; but each of us can work to change a small portion of events, and in the total; of all those acts will be written the history of this generation.